OBSERVER/MOBITEL CRICKET: With the school cricket season is almost over, the voting for the Observer/Mobitel Most Popular Schoolboy Cricketer of the Year All-Island and Outstation Contests has reached its climax with coupons pouring over from all directions. From Ranjan Madugalle who was the first Observer Schoolboy Cricketer in 1979 to Bhanuka Rajapakse who won it last in 2010, most cricketers have gone through this process in some year or other, prior to reaching stardom and the outcome of this year’s competition too, will have no exception. This competition has not only given recognition to the ultimate winner, but has also given a tremendous boost for the winners of the other categories as well, like best batsman, best bowler, up and coming team and the most disciplined team etc. Like many other top schoolboy batsmen in the past, the 2007 World Cup captain Mahela Jayawardene won the Best Batsman’s award during his school cricket career at Nalanda College. The Schoolboy Cricketer of the Year Competition which has lasted well over 3 decades, to be precise 32 years, has been a feeder of top quality cricketers to the national team. Among them are four past Test captains namely Ranjan Madugalle, Arjuna Ranatunga, Roshan Mahanama and Marvan Atapattu. These cricketers who have been held in high esteem in the International arena. Madugalle is the ICC Chief Match Referee and Roshan Mahanama who was the Schoolboy Cricketer of the Years (83’-84’) is also a match referee. Besides that, Kumara Dharmasena who was judged the Schoolboy Cricketer 1989 has taken up full-time umpiring and had the honour of officiating in a World Cup 2011 semi-final match after not being in the Elite Panel of Umpires. During an era, although the school cricket standard was said to be the best in the world, the outstanding player did not get the due recognition for their efforts. 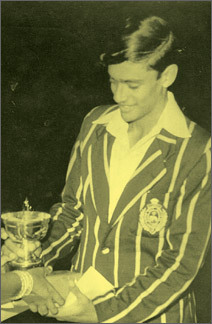 However, The Observer stepped into the scene in 1979 to organise the first Schoolboy Cricketer of the Year show mainly to recognise the outstanding talent of the players. From then onwards, the players have been rewarded and also it has been a much looked forward event with a lot of enthusiasm among the youngsters. 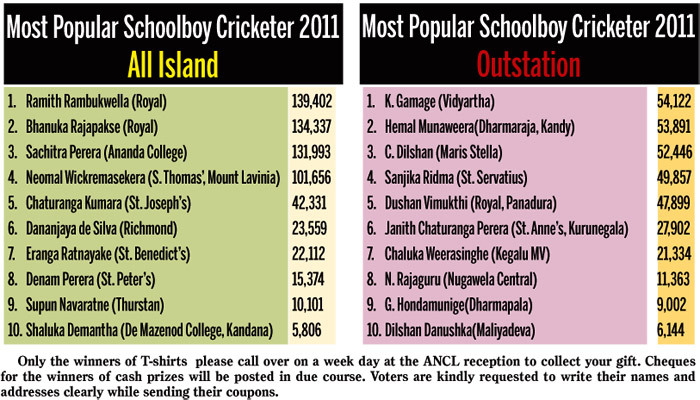 This year’s run for the Most Popular Schoolboy Cricketer (All-Island) should be a three cornered tussle between three of the most talented players - the two Royalists Ramith Rambukwella and Bhanuka Rajapakse who won the contest last year. There is also another prolific wicket taker in the season Sachitra Perera. Sachitra, missed the selection for the Sri Lanka Under-19 team against their England counterparts by a whisker after taking over 100 wickets for the season, but Bhanuka Rajapakse who captained the team made a mint of runs while Rambukwella proved his worth whenever he was given the opportunity. After a bit of a lull in the voting process in the Hill Capital Kandy, suddenly there has been a stiff competition between Hemal Munaweera, the Dharmaraja College captain and K. Gamage of Vidyartha. Kandy has always contributed immensely towards the competition right from the inception. There were three recipients from the Hill Capital. The first was none other than the spin wizard Muthtaih Muralitharan who won the award in 1991 followed by another Katugasthota Antonian Sajith Fernando in 1992. Muralitharan retired from International cricket recently. Sajith Fernando should consider himself a bit unlucky for not representing the country at the highest level, although he had captained many ‘A’ team tours. Kaushal Weeraratne is the only Trinitian to win the coveted award. Weeraratne played with the World Cup cricket captain Kumar Sangakkara, while at Trinity. Weeraratne played for Sri Lanka in ODIs. He is also a fine rugby player who excelled as a winger. 1. Rs. 2,500.00 - E.M.